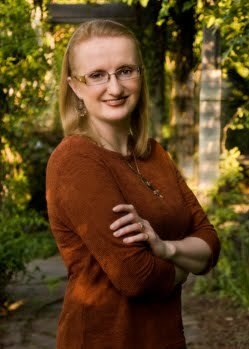 Lisa Shearin is an American author of the Raine Benares series, about a sorceress and seeker of things lost and people missing, who gets mixed up with an Artifact of Doom. She is also the author of the SPI Files series, an urban fantasy series about Mackenna Fraser, a seer employed to locate paranormal creatures for an organization dedicated to protecting humans from the supernatural and upholding The Masquerade. Betty and Veronica: Mychael (virtuous paladin) and Tamnais (roguish duke) to Raine. Mychael wins. Cleaning Up Romantic Loose Ends: After the Love Triangle is finally resolved in Mychael's favor, the remaining suitor gets together with his head of intelligence. Deadly Decadent Court: Politics in the goblin court are literally cutthroat. The elven court and the Council of Twelve are less violent, but equally corrupt. Diplomatic Impunity: Just about everyone with diplomatic status. Nobody ever points out that the Guardians have more than enough evidence to declare them Persona Non Grata and throw them out of the city for this. Drinking Game: Students and off-duty guards invented one where they drink whenever the archmage snarks during a speech. Everyone involved generally gets hammered. Gargle Blaster: Raine bonds with her mother-in-law to be over a couple of bottles of very rare, expensive and powerful rum they find after they end up stuck in the archmage's wine cellar after a battle. When they get extracted, the archmage expresses astonishment that they are still alive after drinking both bottles. The Highwayman: Mychael's mother used to be one. I Just Want to Be Normal: And escape this artifact! Make-Up Is Evil: One villainess is marked out by her excessive make-up. Our Goblins Are Different: Very civilized, for one. Virgin Power: Needed to find the Scythe of Nen. Good luck finding a virgin on a college campus on short notice. White Sheep: Raine is the only respectable Benares. Most of her relatives are pirates, the one named exception is a crooked banker. Deal with the Devil: Complete with a notarized contract. And then it turns out the demon was selling goods that weren't his to sell, and his boss wasn't happy when he found out about it. Celebrity Resemblance: Mac's supervisor, Alain Moreau, looks a lot like Anderson Cooper. Donut Mess with a Cop: At one point Kitty bribes the NYPD to leave a crime scene for a while so SPI can examine it for evidence of the supernatural with a large bag of baked goods. Dragon Lady: Vivienne Sagadraco is referred to as this. Mainly because she really is a dragon. Explosive Breeder: Grendels only reproduce once every fifty years or so, but when they do, they lay three batches of 20-30 eggs each. This is a major reason as to why they haven't been hunted into extinction by SPI Scandinavia (Despite their best efforts). Famous Ancestor: A minor character in the first book is descended from the Norse hero Sigurd. Ian turns out to be descended from the Celtic hero Lugh. Fantastic Drug: Brimstone allows people to see through illusions. This causes humans who take it to freak out when they realize that the non-humans hidden under glamours all around them are non-humans hidden under glamours. Female Gaze: Mac's description of the Mythos exhibit is definitely skewed towards the Mr. Fanservice aspects of the artwork. That, and her equally-feminine flinching from a depiction of Hades abducting Persephone. Groin Attack: Fraser's first piece of desk bling - an anatomically correct leprechaun doll with his pants around his ankles - refers to an incident where she cornered a group of naked drunken leprechauns in a McDonald's and tasered their leader in the Happy Meal. Horror Doesn't Settle for Simple Tuesday: The first book takes place during the week leading up to New Years, the second on Halloween. Both times there are story-related reasons why (A monster attack at the New Years Celebration at Times Square would be impossible to cover up, Halloween being the ideal time for certain rituals). The third book takes place during the rather unremarkable and holiday-free first week of November, because it starts just after the second book ended. The fourth returns to the pattern, with the climax taking place on the summer solstice. The calendar date of the fifth novel is almost totally unknown, beyond the fact that it takes place almost exactly 100 years since the signing of a treaty (which expires after 100 years, the book is about events taking place in the hotel where a new treaty is being negotiated). Mad Lib Thriller Title: Just look at the list above. Masquerade: Part of SPI's mission is to keep the existence of the supernatural hidden from the general public. Mineral Macguffin: The second book centers around the theft of the Dragon's Eggs, seven magically powerful diamonds that were once owned by the Romanovs. Noodle Incident: Mention is occasionally made of cases that happen between books. One notable one was a Siren infestation during Fleet Week, which SPI was only able to cover up because all the witnesses were drunk. Another is known to have involved Ian, the Gates of Hell, and Hoboken, NJ. Office Romance: Though Mac is clearly attracted to her partner Ian, they aren't in one, because they both understand how difficult it would make working together if things fell apart. At the end of the second book Ian has started dating a dryad in SPI's PR (Read: invents semi-plausible mundane explanations for supernatural incidents, like a statue coming to life actually being animatronic) department, with Mac's knowledge and approval. Said relationship is still going as of the end of book five. Pop-Cultured Badass: More like Pop Cultured Action Survivor surrounded by Badasses, in Mac's case. Shared Universe: The SPI novels and the Raine Benares novels take place on different dimensions, but there is communication and travel between them. The SPI novels have multiple references to events in the Raine novels. Raine's cousin Mago is a minor character in the fifth book. Single Line of Descent: One of the things that has to be done to break the curse that banished the Fomor to the oceans was exterminate the line of Lugh, the hero who defeated the Fomor King and banished them thousands of years ago. Despite all the millennia, it appears that there is only one living descendant (or at least, only one that matters): Ian. Southern Belle: Mac's North Carolina upbringing colors her manners, her taste in food, and her feisty response to slick talkers or threats to her "family" at SPI. Superhero Trophy Shelf: Every SPI agent has a collection of 'desk flair', little knickknacks given to them by their coworkers that reference notably impressive or embarrassing things they have done. Supreme Chef: Kitty Poertner, New York's top portal witch, is a first-rate baker. She apparently gets called on to provide SPI with scones more often than she is called on for her expertise with portals.